Lambing 2017 came to an end this week with us having our last two ewes, Baa Baa and Coco, both giving birth to twins. In total we’ve had 17 lambs with 12 being ram lambs and five being gimmers. It’s the most successful year to date and Mac the ram has done a fine job. 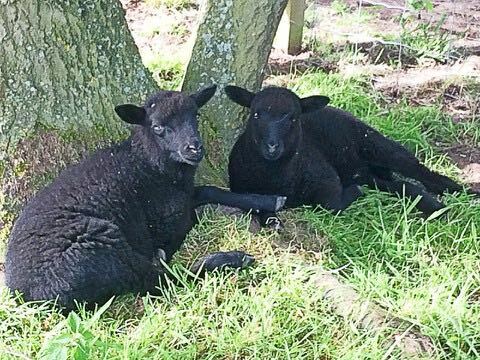 This year’s influx are most certainly the cutest lambs we’ve ever had too. There are just so many different colours, from those who are completely dark brown, there’s black ones, black with a white flash on his head or on her ear, two white ones and lots of multi-coloured ones with a mix of greys, browns, white and black. No names as yet, but we need to decide what the plan is first, as I don’t want to be naming those who may be leaving later. On Saturday, it was time for some of last year’s lambs to move on. It’s sad, but they’ve gone to live on a farm up in North Yorkshire and we have to be sensible with these things as we only have so much space around here. This week was a bit of a week for animals leaving us, as Max our visiting billy goat also left to go home. It appears that he has been busy whilst he’s been with us as both Stacey and Bambi are both growing wider by the week, but we don’t expect kids to arrive until later in June. We will also be bidding farewell to George and Mildred, two of our Aylesbury ducks. Why are you getting rid of them, I hear you ask. Well, let me explain. We currently have four ducks on the farm, George and Mildred and Frank and Betty, (as in Spencer) who happen to be the parents. Now for far too many weeks, George has been getting into bother with his father several times a day and to say the least it’s getting just a tad wearing. It appears that he believes he has the right to do just as he wishes, just when he likes and of course Dad thinks differently, especially when it involves George making amorous advances towards his mother! To make matters worse, Betty has been sitting on a nest full of eggs for the last few weeks, but George keeps chasing her off the nest and so the eggs are all being wasted and broken in the turmoil which goes on. So, to bring peace once more to the farmyard and to give me a break from hurtling around the place separating, scrapping ducks every half hour, we have found another forever home for them to live and so they will be leaving us on Saturday. This week we have been doing some rejigging in the vegetable patch with additional planting out and extra security measures required, much of which has been the result of far too many visitations from ‘Thumper’ and Co.
Those little rabbits look oh so cute, but if they get half a chance they will decimate our veggies again. We have already had to take additional precautions as we found two rabbit holes in the raspberry patch, one in the carrot patch and it appears that they had also done all their workings out correctly, because they managed to dig a hole from who knows where, but it came up slap bang in the middle of the greenhouse and I’ll tell you what, Mrs M was not a happy bunny to say the least!